You know that old "nice guys finish last" canard? Totally a canard! 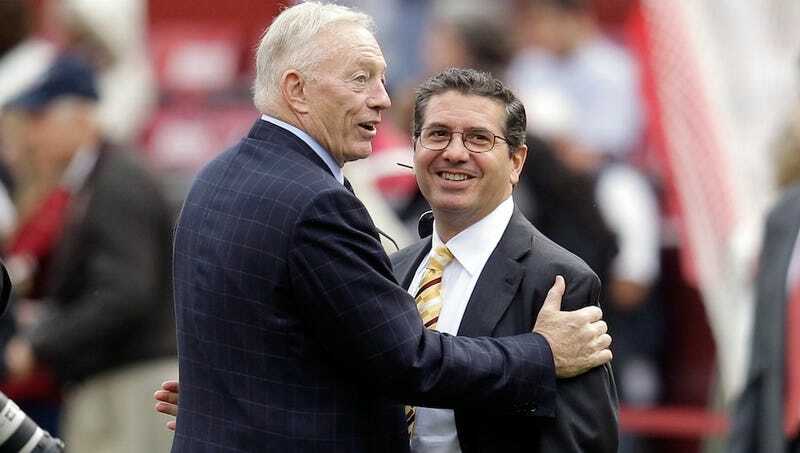 Here's why: Adam Schefter reports that Dallas will lose $10 million in cap space over the next two years for front-loading contracts during 2010, the uncapped NFL season. Washington will lose an impressive $36 million during the same span. (This is especially bad news for the Redskins, who were planning on surrounding shiny trinket draft pick Robert Griffin III with shiny trinket free agents because they gave away all their other draft picks trading for Griffin.) Given that these franchises are owned and (micro-)managed by two of the most reprehensible humans in the parade of reprehensible humanity that is NFL ownership, we don't mind their punishments all that much. We should, however, say this: It's quintessentially Goodellian—and ridiculous—to gin up a salary cap in years where collective bargaining says there isn't a salary cap. Roger retroactively slammed his pudgy fist to crush labor's interests. It's collusion, and it wouldn't be tolerated in other leagues. But this is the NFL, where rules are routinely fudged on the fly to deal with imagined moral hazards or uppity help. We're used to this practice by now, and we imagine it will continue unfettered. So with all that said: It couldn't have happened to two nicer guys.